Hallways full of history free breakfast and a massive conference center are all part of guests' stays at the historic McLure Hotel in downtown Wheeling. For 160 years the McLure Hotel has hosted presidents governors Civil War generals and famous entertainers. This grand seven-story property features a spiral staircase and a crystal chandelier in the lobby plus 170 rooms a professional conference facility an 8000-square-foot ballroom and an executive boardroom. Bellhop service is available to take guests' bags up to their rooms which are equipped with Wi-Fi access cable TV desks and coffeemakers. Guests can enjoy a free continental breakfast of pastries coffee and juice and later have a drink at the on-site bar. Laundry facilities and a business center are also available. Free parking is offered in the multi-level parking structure. Small pets are allowed for a fee. The McLure is three blocks from the river in downtown Wheeling. 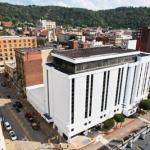 It's within four blocks of Independence Hall the WesBanco Arena the Capitol Theatre Centre Market the Civic Center the Victoria Vaudeville Theater and the historic Wheeling Suspension Bridge. The Wheeling Island Casino and Racetrack is one-and-a-half miles away. Oglebay Park which features a golf course a zoo and horseback riding is five miles away. Outdoor equipment supplier Cabela's and the massive Highlands shopping and entertainment complex are 15 minutes away. The hotel is 49 miles from Pittsburgh International Airport.